Thank you for considering our jewelry. We have worked hard to get all the bugs out of the shipping and delivery process and aim to keep it pretty simple. Each piece is packed and shipped in paper packaging, carefully, either by USPS or UPS in a durable shipping box. The jewelry itself is wrapped in tissue, packaged in a velvet presentation box inside a small white cardboard box. Included in the package are a selection of printed materials designed to be appropriate to the piece. By default, we ship via insured UPS Ground, which takes 4-5 days within the US. If you are having the item sent to your PO Box, or are selecting our free shipping service, we will instead ship insured priority US mail. We also happily ship to APO addresses, using Priority Mail through the U.S. Postal Service. Standard shipping charges are anywhere from $9 to $30 for UPS Ground, depending on the value, or $25 and up for UPS 2nd Day. International Shipping: If you select our standard shipping charge at checkout, then we will ship using the US Postal Service Insured Priority Mail at a discounted rate. This service has been very reliable, taking about a week to arrive. If you select our more expensive shipping option, we will ship via USPS Express Mail which is also trackable online and faster, about 3-7 days. International VAT Taxes and Customs are somewhat unpredictable - occasionally the package gets through unmolested, but often it gets picked out, and rather high charges can be applied, which are unfortunately beyond our control and the scope of our business. Please be aware, if a package arrives overseas safely and is refused by the customer, and returned to us for non-payment of customs duties, there will be no refund. Due to the handmade nature of these items, and the work put into packaging and shipping, our policy is that we are unable to accept returns or exchanges. I do apologize for this. We proudly offer a lifetime craftsmanship warranty. If you discover any defects in craftsmanship or functionality, we will be happy to repair or replace the jewelry at no charge. 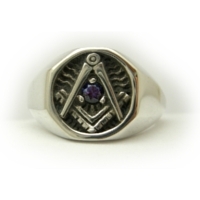 We are confident that you will be happy with the item ordered, our many satisfied customers can attest that we consistently offer the finest Masonic jewelry available. However, if you have any questions or concerns we will work as hard as possible to honorably resolve any issues. We thank you kindly for your patronage, and hope you will come back often. Meet on the Level, Act by the Plumb, and Part on the Square.